Bearing a strange resemblance to the admittedly far quirkier Adaptation, The French Lieutenant's Woman takes the rendering of a period novel onto the big-screen and parallels it with the actors filming said adaptation. 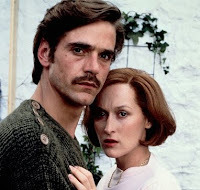 In this dual story-line, actors Anna (Streep) and Mike (Jeremy Irons) struggle through a behind-the scenes affair during the filming of an adaptation of John Fowles' book, The French Lieutenant's Woman. The scenes with the characters of Sara (Streep) and Charles (Irons) are played as if they are just as real as the actors' counterpart scenes. Sara is considered a "ruined woman," having had an affair with a Frenchman until he abandoned her. Exiled within her own region, she enchants the likes of Charles, a scientist who's recently made a love match with a wealthy heiress. As the drama unfolds within the movie, though, it's hard to not to treasure the "actors'" limited number of scenes, as Irons and Streep both seem much more natural in these 1980s moments. Probably going against the grain, I'd have to say my favorite of the four performances is that of Streep's portrayal of the actress Anna. It's the one with the least screen-time, but it's subtlety and elusiveness is a treat that viewers can often expect from Streep. Though the it was difficult for me to see the uniqueness of The French Lieutenant's Woman, I can at least appreciate an admirable performance when I see one. Streep is relatively new still in 1981, so the slightest hints of potential growth are to be expected.